The Dartmouth Board of Trustees elected Laurel J. Richie ’81 as chair of the Board at its meeting this weekend. Richie will succeed current Chair Bill Helman ’80 at the conclusion of Helman’s three-year term on June 17. Policy studies major Richie joined the Board in 2012 as a Charter Trustee and currently serves as Vice-Chair. Richie will be the first African American to chair the board. Susan Dentzer ’77 is the only other woman to have served as chair of the Board, serving from 2001 to 2004. Richie, who currently sits on the board of Synchrony Financial and previously served on the Naismith National Basketball Hall of Fame board, is known for her marketing and management expertise. From 2011 to 2015, she was president of the Women’s National Basketball Association, making her the first leader of color in a major national sports league. Before joining the WNBA, Richie worked at Girl Scouts of the USA as senior vice president and chief marketing officer and at Ogilvy and Mather, an advertising agency. Richie worked at Ogilvy for 20 years and, upon leaving, served as a founding member of its external Diversity Advisory Board. Several organizations have recognized Richie for her work, including Black Enterprise, which named her one of the Most Influential African Americans in Sports. “I’m honored, I’m excited. 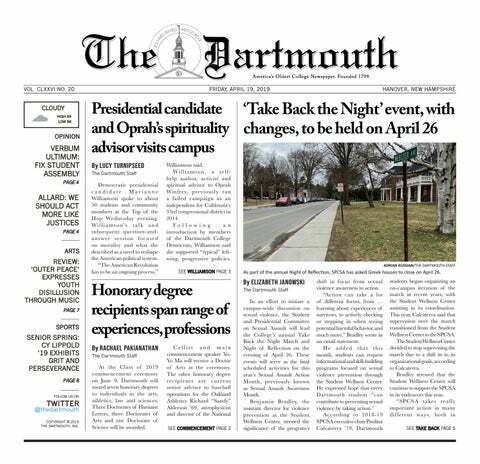 I have great love for Dartmouth, so to be able to serve as its chair is a real honor,” Richie said. Richie explained how her past experience at Girl Scouts of the USA and the WNBA influences her desire to bring her strengths in creativity and communication to the Board as chair. Richie cited the appointment of College President Phil Hanlon as the most significant event during her tenure on the Board thus far. She explained her support of the new house communities, the Inclusive Excellence Initiative, and Hanlon’s commitment to a “world-class” faculty. As Board chair, Richie hopes to share Dartmouth’s special character. The original version of this article stated that Richie is a native New Yorker and a member of the Naismith National Basketball Hall of Fame. She is not a native New Yorker and no longer serves on the Naismith board.